Georgios Vizyenos (1849-1896) is one of Greece’s best-loved writers. 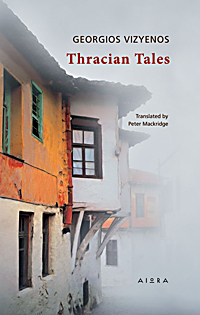 His stories, written in 1883-4, are set in his native Thrace, a corner of Europe where Greece, Bulgaria and Turkey meet. Each title poses an enigma: Where did Yorgis’ grandfather travel on his only journey? What was Yorgis’ mother’s sin? Who was responsible for his brother’s murder? At the end of each story the narrator possesses some knowledge that forces him – and his readers – to revise their earlier assumptions, which were based on incomplete knowledge. Because Vizyenos wants us to experience the difficult transition from ignorance to knowledge, he leaves us in suspense until the very end. Vizyenos’ stories evoke a time when individual Greeks and Turks could share each other’s joys and pains despite the hostile relations between their governments.